With the majority of H-D models now falling into the Softail range, it follows that most buyers will be making their choice from the nine offered within this newly redesigned category. You’ll recall we tested the Street Bob last September and we’ve ridden the Fat Boy and Breakout since then and can report that each one has its own character and appeal - or not. Our Milwaukee-Eight 107ci Low Rider test bike came from Harley Heaven Western Sydney and I could see a glint in the eye of dealer principal, Craig Smith, when he handed me the keys. He wasn’t kidding. Not that a Stage 1 will blow you away exactly, but you will notice the (around) 10 per cent extra power and torque coming in early and staying there as you accelerate through the rev range. The ‘oomph’ kicks in quicker and the twin pipes have the orchestra playing with extra ‘forte’. My apologies to the neighbours. This bike also came in the factory ‘Vivid Black’ scheme which harks back to knee-high sports socks and horseshoe moustaches thanks to the retro tank livery. There’s lashings of chrome too, all around the twin tank dials and front fork arrangement. This much chrome can have its downside though when the bright sun reflects off it. Get Craig to throw in some H-D polarised sunglasses with this one. Out on the road, I found myself on the pace quickly within our riding group of mixed abilities. We took the familiar route through the Royal National Park and back through Appin and Wallacia, so there’s plenty of tight corners and some lovely sweepers. Some might feel the riding position unfamiliar and perhaps not suited to brisk riding through the twisty bits but - remember I’m still an H-D novice - I don’t think I would have gone any faster or slower on any others from the Softail range. The rear monoshock can be easily adjusted to suit your own style and comfort, as with any bike in the Softail range. 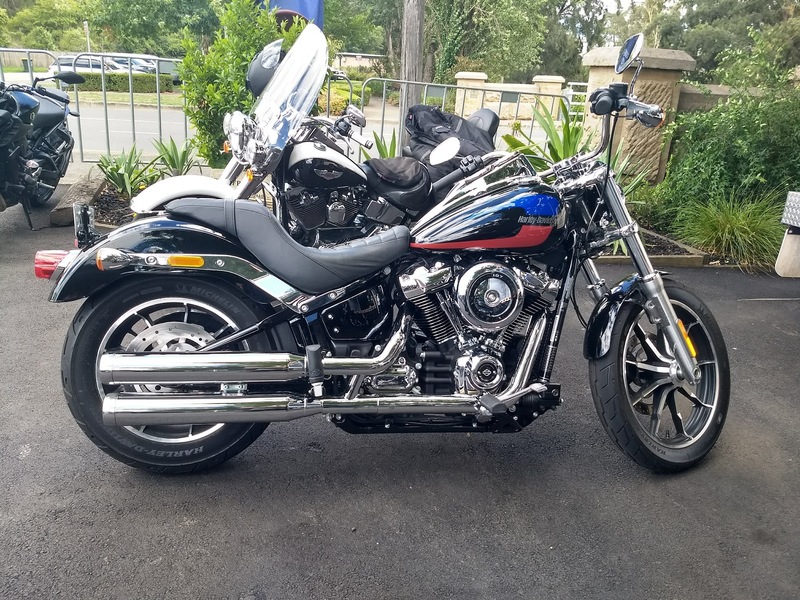 Low Rider comes in close to the Softail range entry-level and will suit regular sized guys and gals (up to about 180cm) as well as those keen on further customisation. And when you’re trying out your new Softail, be sure to test them all. It’s a very personal choice and if the Low Rider is not for you, there are eight others (and counting) to choose from. 107ci Milwaukee-Eight engine (1,745 cc) with optional Stage 1 Screamin’ Eagle performance kit.